You can filter opened positions by Magic Number. Works on any timeframe and any pair. You can use Trend Info Panel to see the trend of MA,RSI and CCI on All timeframes. Trailing method - choose one of the seven algorithms (MA, Fractals, SAR, ATR, Movement of Candlesticks, Profit and Points). Distance in pips - distance, where trailing start. Trail Step in points - step of trailing points. 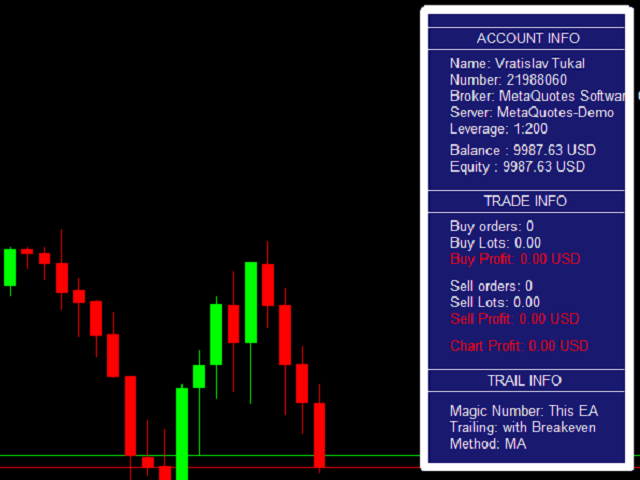 Minimal profit in points - set minimal profit pips. Use breakeven - true/false to use breakeven. Use Virtual Trailing Stop - true/false to use Virtual Trailing stop. Timeframe for indicator - timeframe for chosen indicator of algorithm. MA period for MA Method - period for MA indicator. Mode for MA Method - method for MA indicator. Price for MA Method - price method for MA indicator. SAR Step for SAR Method - SAR step setup. 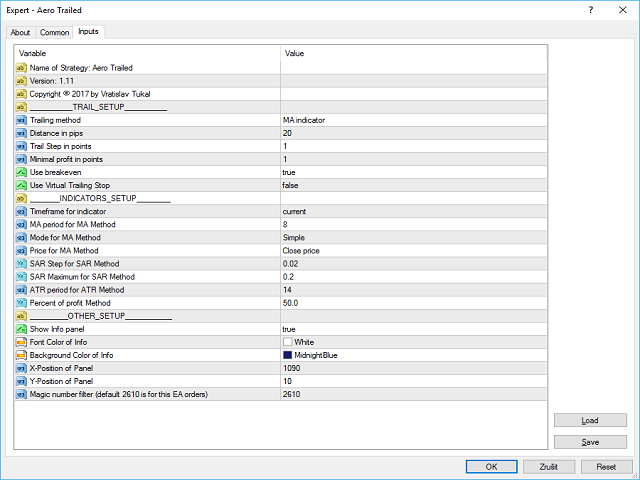 SAR Maximum for SAR Method - SAR maximum. ATR period for ATR Method - period for ATR indicator. Percent of profit Method - define percent profit of your balance to close orders. Fast Period - period for fast RSI. Slow Period - period for slow RSI. Price - price for RSI. Fast Period - period for fast CCI. Slow Period - period for slow CCI. Price - price for CCI. Fast Period - period for fast MA. Slow Period - period for slow MA. Mode - mode of MA. Price - price for MA. Show Info panel - true/false to use Info panel. Show Trade panel - true/false to use Trade panel. Show Trend panel - true/false to use Trend panel. Font Color of Info - color for font. Background Color of Info - color of info panel background. Corner of Info Panels - left/right. Magic number filter - define magic number to filter orders. I would recommend. A very good tool, a lot of interesting features,. This must be the best way to manage your trades. Added Trend Info Panel, some graphicals edit.